Windows comes with a decent assortment of fonts, but they're pretty basic. If you want to jazz up your newsletter, school report, work documents, or even video titles, you need to find an outside source. The aptly named 1001 Free Fonts is a great place to start. It offers--wait for it--1,001 fonts for Windows (and Mac, if you're interested), all of them free to download, no strings attached. They're alphabetically organized, but that probably won't help unless you're looking for a particular typeface. A better bet is to browse the categories, which run the gamut from Animal and Asian to Sci Fi and Typewriter. I particular like the Famous section, which reproduces various well-known fonts (as shown in the above example). 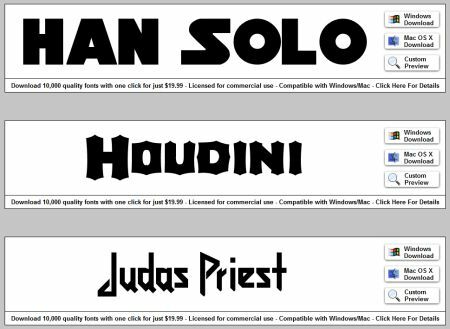 If you'd rather not download fonts one at a time, the site does offer a collection of 10,000 fonts for the pretty reasonable price of $19.99. Font for thought.